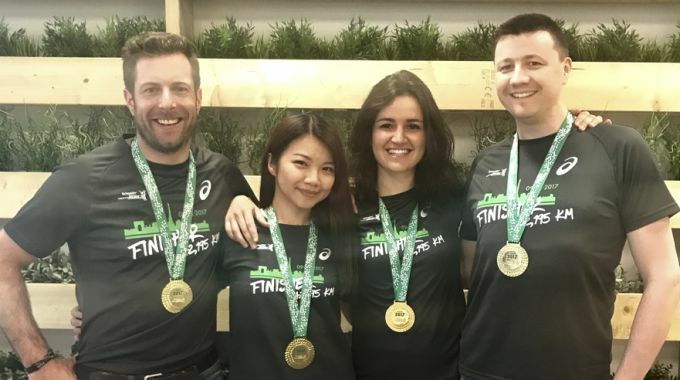 On the 9th of April 2017, four LOVESPACE-rs ran the Paris Marathon together. For some of them it was their first. We’re so proud of them we had to tell everyone we know about it! Fortunately we can report that everyone finished strong and without any injuries. However, there were a few tears to be seen – partly pain, but mostly joy. To commemorate their bravery and determination, we’re dedicating this post to them and we’ve done a group interview to see what they thought of their whole experience. To any future marathon runners, we hope these words of encouragement will help you on your journey to running a great race! Q: What was your biggest challenge leading up to the race? CANDICE: Definitely the discipline to keep up with the training! We signed up for the Marathon in Nov 2016, when it was dark and cold outside. Not exactly the encouraging weather I’d like for training. The training literally took over my social life. And I dreaded every other Sunday as those were the long distance runs; starting from 15km, building up the all the way to 35km! DAVE: Taking on a marathon from the starting point I had (genuinely zero exercise for the previous 12 months, starting from the ‘couch’) in the time scale we had was a lot of motivation. Plus the training apps and professional trainers I spoke to all told me that the time scale also meant that it was only just possible for me to get ready for the marathon in time! However, in the darkest, coldest and wettest months of winter, it was very easy to come up with excuses to not train! I had to keep telling myself that nobody benefits from me not training properly, dug deep and carried on running. But the training could also be awesome: One weekend morning in December I was training in French Pyrenean foot hills, it was dark, wet, with ice on the never-ending, climbing road. Then the sun starts to rise behind mountains, the sky glows and the birds seemed to call me on. That was something pretty magical that I’d never have experienced without training for the marathon! MITCH: The biggest challenge I faced, was motivating myself to train properly and gradually build up the mileage over the months leading up to the race. Having completed a number of marathons in the past I was pretty complacent about the challenge, but paranoid about getting injured prior to the race from over training. In the end I only did the bare minimum of training, favouring a “balls to the wall” approach on the day! Q: What was on your mind during the 42.195km race? Did anything interesting happen? CAROLINA: During the race, I was being very OCD; trying to keep my pace and KMs under what I knew I could do. I kept thinking: “If I can do the first 20km and feel ok, then it’s just doubling it”. Then,“If I am at the 30th km, I can CRAWL for 10km more”. You get my point. CANDICE: For the first 21km, I was keeping track of my pace at every 1km. But after that I told myself “FORGET IT AND JUST FINISH IT!” and constantly had the image of crossing the finish line – that kept me going. These were on repeat in my head throughout – “You can do this!” “Don’t quit on me!” “Come on, give it your all!”. DAVE: Running down the Champs Elysees at the start and seeing a huge wall of people running ahead was awe-inspiring! Realising this was really happening and that I was going to get to the end of a 42.2km track now, there was just no way I could not finish, regardless of how long it would take or how much it would hurt. There was just no future in which I wasn’t going to finish the race! That was a pretty weird feeling, but it kept me going when I really wanted to not go any more! The people drumming on the roadside who’d been doing that for hours by the time I ran past – that was a great lift. Seeing Mel, my wife, at several points along the route was great! She ended up doing a half marathon that day just to get to the right point of the route at the right time to see me! MITCH: It is hard to beat running down the Champs Elysees in the sun, listening to music pumping out across Paris! However, after the 1st kilometre and the music had disappeared, it became a mental battle to deal with the heat, energy levels, hydration and pain killer management. I really enjoyed the varying scenery, typically French approach to managing the spectators on the course and the idiosyncratic water stops. Q: What were you feeling when you saw the finish line, and when you crossed it? CAROLINA: The finish line was awesome, I felt like I could face any challenge from now on! CANDICE: The adrenaline rush hit me hard when I saw the finish line from afar, all the pain seemed to have disappeared as I sprinted across. It was one of the best feelings in my life – knowing that in future whatever goal that I set myself to, I will accomplish it no matter what obstacle I face. DAVE: The finish line was amazing! The feeling of relief that I could stop running, the feeling of accomplishment, the feeling of belonging to a very weird bunch of people who decide to grind out the training, the miles of solitude, the hundreds of kilometres of preparing their bodies to run a marathon… nutters all! MITCH: The final few miles were tough going, having not paid enough attention to the course map, I mentally lost track of the last few miles and so, was genuinely surprised when I came around a corner and saw the Arc de Triomphe. It was great to have completed a marathon in such an iconic location, I am looking forward to the next one, which I have promised myself, I will train for! Well done team!! Hopefully this post will serve as an inspiration to anyone who wishes to run a marathon (or take up any challenge at all!) and know that nothing is impossible when you have the right mindset and attitude.